In the spring of 2011, planning began of a pioneering construction project. 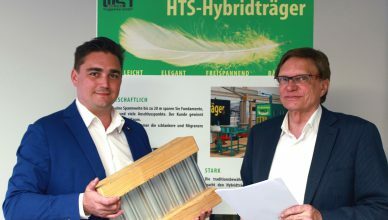 The company Pazen Fenster + Technik GmbH based in Wittlich designed and built the first industrially-used passive house project in Rhineland-Palatinate. The supporting structures in the building were predominantly HTS beams. The timber magazine Mikado reported on the groundbreaking project in its 08/2012 issue. You can find a copy of the press report in the annex. Now, 4 ½ years after Pazen moved into its new manufacturing and administration building, a sufficient amount of data and experience on passive construction has been collected for analysis. The anticipated building characteristics have been met – and in some areas exceeded. The production halls and the offices are pleasantly cool in summer, in winter the engine waste heat is sufficient to control the temperature so that the woodwaste heater only has to be used in extremely low winter temperatures. Pazen is very pleased with its decision to build its production facility using a passive house construction with HTS beams. It is unfortunate that more developers do not consider this type of building, especially as in the long-term, the energy costs and the operating costs of a commercial plant will rise inextricably. In addition to the economic benefits, today’s “green” arguments for reducing CO2 emissions by using suitable building materials and cutting back on energy expenditure in running a plant, never mind the passive advantages to be gained from the image of a green company are not to be underestimated. 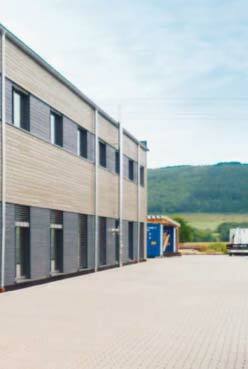 WST Tragwerke GmbH offers consultation on the benefits of highly-insulated commercial and industrial buildings. We can provide contact to architects and engineers in your area who are familiar with passive construction, who understand and support eco business development and can offer guidance on your project. Please find the Mikado press report here.